As part of Vision Zero, installation of side guards and convex mirrors on large trucks will reduce severity and risk of injuries from crashes. 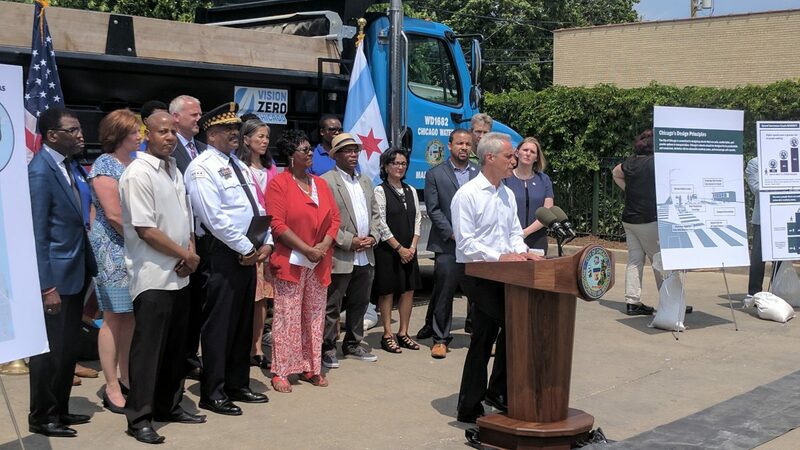 Mayor Rahm Emanuel announced that Chicago will begin implementing a major traffic safety proposal of its Vision Zero Action Plan thanks to an ordinance that passed City Council today requiring City contractors to install low-cost, life-saving equipment on its large trucks. The ordinance requires City contractors to install side guards and convex mirrors on vehicles weighing over 10,000 pounds. This type of safety equipment is mandated in the United Kingdom, where research has shown that since its implementation there was a 20 percent reduction in pedestrian fatalities and a 61 percent drop in bicyclist fatalities from side-impact collisions with trucks. Recognizing that some small family owned businesses might find even these requirements financially challenging, the ordinance provides nearly a year’s notice for the first phase of compliance, which is for 25 percent of the vehicles used on City contracts to have these safety devices. It also provides for six-month extensions if any of the deadlines for compliance cannot be met. Finally, there is a process for waivers to be granted in cases where an applicant can demonstrate undue financial hardship in complying with the requirements. The relative low cost and proven safety benefit have also led many U.S. cities, including Boston, New York City, and Seattle to establish policies for the installation of side guards on city-owned heavy vehicles and/or vehicles working under city contracts. Contractors will be required to phase in the installation of safety equipment, starting on July 1, 2018, with full compliance required by July 1, 2021. It will impact new contracts over $2 million in value in the following areas: construction, “job order contracts” where the work of an individual order exceeds $2 million and non-construction contracts whose performance requires the use of large vehicles. Over the next decade, the City will also phase in the installation of side guards and convex mirrors on trucks in its fleet. According to crash data, there have been 33 fatalities in Chicago among pedestrians and cyclists since 2010 involving large vehicles. Of pedestrian and bike crashes with all vehicles since 2010, large vehicle crashes are three times more likely to be fatal. 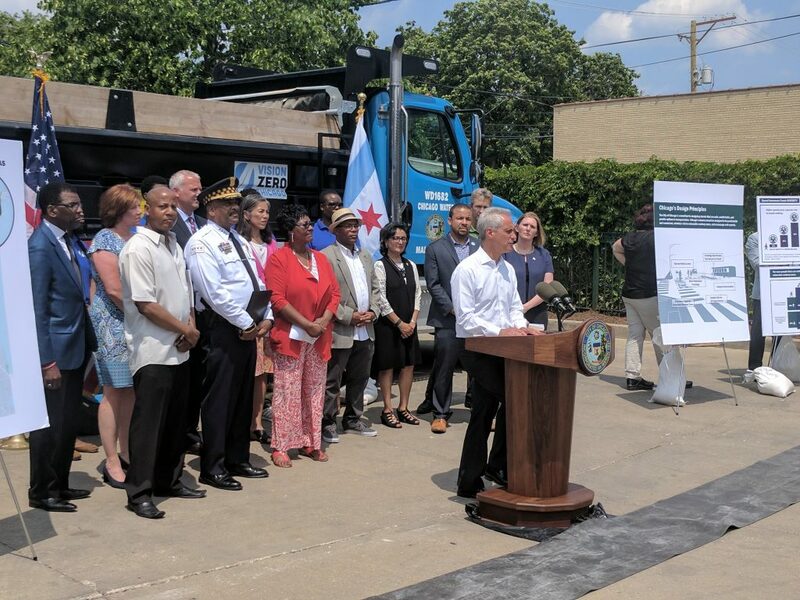 In June, Mayor Emanuel announced the multi-agency effort involving one dozen departments and agencies including CDOT, the Chicago Department of Public Health and the Chicago Police Department. The Vision Zero Chicago Action Plan is a data-driven, multi-agency approach that looks at traffic safety as a public health challenge and is designed to improve traffic safety for all road users. The ultimate goal of Vision Zero is to reduce roadway crashes and eliminate traffic fatalities and serious injuries in Chicago by 2026.